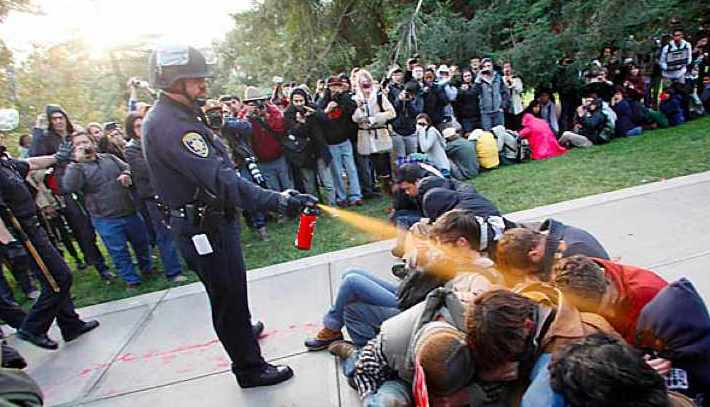 On Friday 18th of November, 2011, Lt. John Pike unwittingly kick-started an Internet phenomenon, when he was filmed pepper-spraying peaceful protesters at a campus at the University of California (UC). The campus police had apparently been instructed by the UC Davis Chancellor, Linda Katehi, to remove tents from the campus, but she said she hadn’t given any directions on forcibly removing the protesters, who were sitting in as part of the Occupy Movement, a global protest aimed at social and economic inequality. Whilst the campus police chief, Annette Spicuzza, has been placed on ‘administrative leave’, two policemen (including Lt. Pike) have already been placed on leave too following the pepper-spraying incident at UC. The many wrongs of the incident speak for themselves, and everyone will have their own opinions on what happened at UC last week. But what has followed on from this is really quite remarkable. The whole Internet has been talking about the pepper-spraying cop – but why? The footage that emerged from UC last Friday showed a string of protesters sitting, arms interlocked refusing to move, and then ‘wham!’, Pike unleashed his orange spray directly in their faces, as nonchalant as you like. Yes, it was absolutely shocking, but the manner in which he did it, it was only a matter of time before the parodies started. There’s this WordPress blog, called Pikes Corner, which has its own ‘humourous’ pepper-spraying-cop offering to share with the world. As everyone will agree, there’s nothing funny about what happened at UC. But the manner in which Pike so casually pepper-sprayed the protesters as though he was cleaning his car lends itself to being parodied. It was that ridiculous. Some may question whether it’s correct to lampoon what would’ve been a horrific situation for those involved. But satire, since the beginning of time, has always been closely intertwined with tragedy and unpleasant events. And laughter is what people use to counteract the bad guys with – especially when the crime in question is so blatant and can’t be disputed. The vision of Pike ambling along a line of protesters, perhaps even whistling the theme-tune to MASH in his head, is iconic. It’s something that has entered folklore and we’ll likely see popping up in countless comedy situations in the future.